Ever feel like you just can't measure up? Like it's impossible to meet the standards of the world, of Pinterest, of your family and friends? Like you can't even meet your own standard of motherhood? Same here. This is a place where we recognize that God works his power through our weakness. This is a place where we celebrate grace without forgetting obedience. This is a place where God is our enough. He measures up, so we don't have to. While you're here, go ahead and sign up for my email list. You'll get a monthly newsletter with a practical look at the spiritual side of motherhood, links to any blog posts from that month, and some funny mom stuff too. Because I know that you get 1000 emails a day already, and what you need most as a mom are God and laughter. If you sign up, you'll get the first two chapters of my book and a resource of 20 biblical prayers for the Imperfect Mom. You may even get some chances at a free copy of my book in the future! If you're new here, I'm so glad you've come. If you've been watching my journey for a while, thanks for your support. I can't wait to see God unfold his perfect plan over all my imperfect ideas for this place! Let's give up on measuring up together! P.S. Doesn't this new website look amazing? 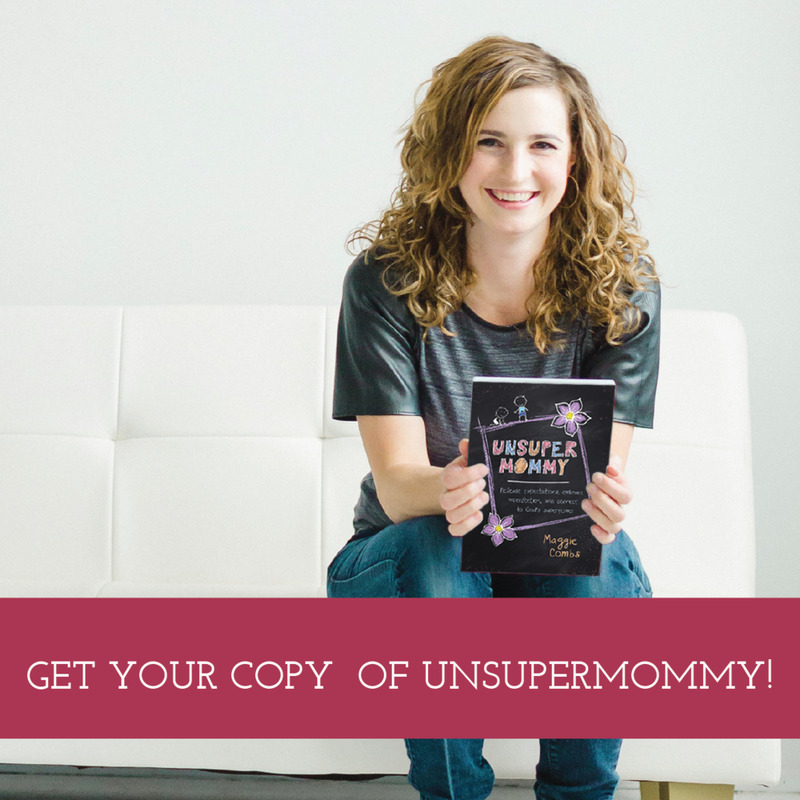 I have to thank Erin at Primavera Studio for getting me and the unsupermommy message so perfectly. And those pictures--right? They're by my awesome friend Gina, who is one outstanding lifestyle photographer. She's also an amazing mommy with a story to tell and a heart of gold who loves Jesus above all. If you need to hear some really honest stuff about infertility and when motherhood doesn't turn out how you plan, please check out her blog! I often think back on those blissful pre-kid days. The ones where I controlled my time, my body, and even my mind. Those days are long gone, but in the rough-and-tumble trials of parenthood, it helps to take a moment to remember that it's not without advantages. Those times when you "can't get a babysitter:" It's the perfect excuse to skip any social events you just don't want to attend: Your second cousin's second wedding? I'm sure that night will prove impossible to find a babysitter. That high school play you can't wait to miss? Sorry, all the grandmas are busy that night. Get to do all those awesome kid activities again: slip n slides, trampolines, trips to the zoo, amusement park rides, swimming pools, coloring books, and sports are all socially acceptable again. Reading your own books can be categorized as setting a good example for your kids: It's true that kids who see their parents reading, read more, so read away! Sit those kids down with their own stack of books and declare it reading time for the whole family! Chores: two words: free labor. Enough said. The perfect excuse not to clean: It's Saturday, and you really should clean your house. Outside the sun is shining and the leaves are ablaze with fall. Never fear! Your kids have to get outside! A trip to the orchard, zoo, park, or arboretum is obviously in order. In fact, it's your job. Go ahead and neglect your home. You've got a free ticket for fun! The weather is awful? No problem--I'm sure your kids are dying to check out a Saturday afternoon movie. Don't fret, you need some family time. Stranger Sympathy: Oh, you mean you have 3 kids? 6 kids? All boys? All girls? 2 under 2? 3 under 3? You must be SO busy. Let me get the door for you. You can go ahead in the Target line. Your life must be so difficult. Yeah, all those things may be true, but it's great to hear them, right? The world knows, this job ain't easy! Enjoy the respect and admiration of strangers and friends alike! The LOVE: Yeah, it's cheesy, but kids love to love their parents. There's nothing quite like the unprompted kiss on the cheek or sweet, unexpected "love you." Parents get the benefit of that cute-as-a-button, pure-faced affection. It might be hard work, but. That. love. It's worth wading through the waters of sleepless nights and endless fights. Despite all our imperfect parenting, those babies love us with all our their mighty, little hearts. Don't ever forget it! I'm with you, having kids is always hard work, BUT, it's not without it's benefits! Take a moment to read an extra chapter today, shirk some cleaning for fun, or better yet, force your kids to do it! You're a parent, you can.